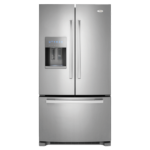 The Whirlpool GI6FARXXY is a 25.6 CuFt Energy Star qualified refrigerator that features sleek tap touch controls and crushed ice. 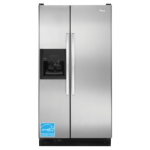 The Accu-Chill temperature management system rapidly returns food to the desired temperature, while the French doors open up to eye-level. A wide-open interior allows you to store view and access all of your fresh food easily. And a full-width pantry is an ideal spot for veggie trays or birthday cakes.